Supermarkets consume 5% of all electricity used in industrialised countries, around half of which is used by the display and keeping the food refrigerated. Energy can be saved through energy-efficient equipment and systems such as cabinet glass doors, thereby reducing environmental impact and increasing competitiveness. However, retailers are usually reluctant to invest in energy-efficient systems with very long payoffs, especially if they serve as a barrier for the customers while purchasing. Innovation: To tackle this problem, EARTO member SP developed with its partners a variety of innovative solutions with a short payoff. 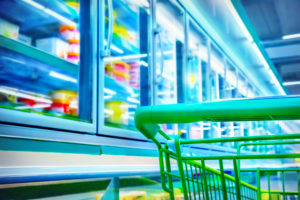 On top of retrofitting cooling cabinets with glass doors, which is the approach taken by some supermarkets today, the central refrigeration unit and compressors are adapted to fit the lower cooling demand. Besides, the condensing heat from refrigeration units is used for heating the supermarket, making heating contracts unnecessary. Impact Delivered: This system enables to reduce the annual electrical demand for this refrigeration unit by 75%, and the payoff for the investment is less than 3 years. As a comparison, only putting glass doors on cooling cabinets lowers the electric demand by only 16%. SP Technical Research Institute of Sweden is an RTO which develops, tests and evaluates technologies, materials, products and processes for national and international customers.